Not bad at all. 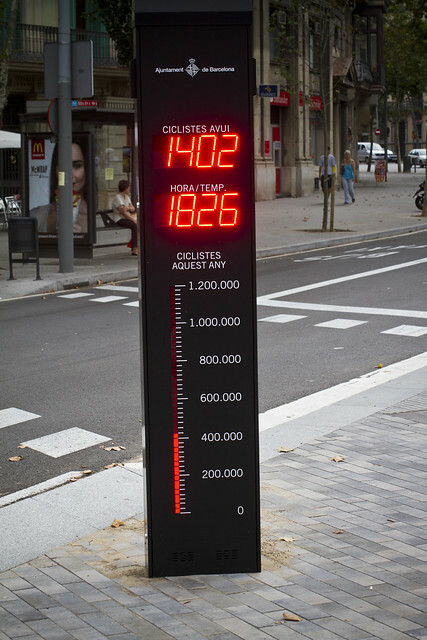 A Bicycle Counter in Barcelona, on Passeig de Sant Joan. We pass it every day on the way to the beach. It's the busiest bicycle lane in the city but it's slow these days with everyone on holiday. Like most other counters of its kind it says Cyclists So Far Today at the top. Then there is the time, which also switches to temperature (25 degrees, by the way) and at the bottom is the number of cyclists past this point so far this year. What Barcelona has done for reestablishing the bicycle as transport in just four short years is an inspiration to other cities around the world. In fact many other cities should be rather embarassed when comparing themselves to this Catalan city. Not just their Bicing bike share programme with over 110,000 full subscribers but their infrastructure and facilities as well. And this is a city with hills AND heat. Me and the kids are staying at a friend's flat in Gracia while he and his family are on holiday. There's another friend of his staying here, a Dutch writer from Amsterdam. I was telling him that we get waved at when we ride around on the Bakfiets. Felix, my son, says that it's like being a celebrity. Eric, the Dutch writer, has spent a lot of time here in the city. He said that merely riding a bicycle around this city like a Citizen Cyclist five years ago had the same effect. People would point and wave. Now, the bicycle is back. Although Barcelona's journey rapid rise has to do with the lack of protective, territorial cycling sub-cultures - which we've discussed in this post about Behavioural Challenges. I'm curious to hear if this counter is from our friends Eco-Counter, if anyone knows.